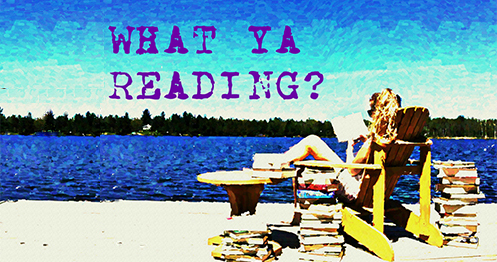 Review of When Destiny Knocks by Heather M. White | What YA Reading? 16 year old Karlie has had a pretty normal life… But when her Mom dies she is forced to move over 1,000 miles away to live with her Dad. That’s when things start getting weird. She can’t explain the earthquakes that nobody else feels, or why she no longer sleeps. But most of all she doesn’t know why she trusts Shane so much, even though his Dad wants her dead. Suddenly, Karlie’s normal life is turned upside down and she enters a world she never dreamed could really exist. I’m not entirely sure how to begin this review. 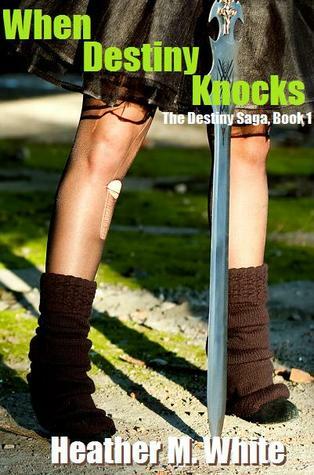 Why don’t I start by stating my first thought after reading When Destiny Knocks? That thought is: this is a really bad book. This is the worst book that I’ve read in a long time. This is possibly the worst book that I’ve read since Miss Peregrine’s Home for Peculiar Children. And at least that one had pictures. Classic mistakes, such as confusing ‘should have’ with ‘should of’ or ‘staring’ with ‘starring’, I can take. The painfully evident lack of contractions, which makes characters sound robotic and staged, I can take. Dialogue coming from a variety of characters mashed into the same paragraph, I can take. I take these with difficulty, but I can take them. However, when it gets to such a point that our narrator goes from the present tense, to the past tense, and back to the present tense in the same sentence, I refuse to sit and take it. Did Miss White honestly not have anyone proofread her novel? A middle school student could have prevented a lot of the mistakes that she made. Actually, a middle school student could have also come up with When Destiny Knocks’s plot. Instantaneous romance aside, I knew I was in for it when characters were chained to walls at the hands of the antagonist and happily offered to kill family members without hesitation—all of this in the name of love, of course. If I had to describe this plot in one word, that word would definitely be ‘juvenile’. Another huge issue that I have with this novel is the world building. When you write a paranormal romance, you can’t just get caught up in the cheesy romance and forget the whole paranormal bit. You have to realize that readers are not going to be satisfied unless they know the basic why’s and how’s behind the existence of your supernatural phenomena. But we aren’t given any information when it comes to Karlie’s protectors or who sent them, why she’s the ‘Chosen One’, or even the extent of her powers. Every aspect of When Destiny Knock’s world building seems unplanned and developed solely for convenience. When Destiny Knocks’s characters are also terribly shallow. The supporting cast consists entirely of flat clichés; our bad guy is apparently soulless—for some reason, this makes him wholly predictable—and Karlie, our protagonist, has two things going for her: her cryptic super powers and her pity card (her mother died and it’s unfair that she can’t be normal, so she has the right to whine 24/7). As much fun as it is to write snarky reviews, I can’t get through this without highlighting When Destiny Knocks’ fine points (however limited these are). I read this novel in one sitting, so I can safely say that the action was fast-paced and there were very few periods where this pacing lagged. Moreover, the cliffhanger ending was gripping, unpredictable and well done. When Destiny Knocks deserves 1/5 stars. The editing was non-existent; the plot was juvenile; the characters were shallow; the romance was artificial. You might enjoy this one if you have a predilection for cliffhangers or fast reads, but I personally did not in the slightest.